Mark A. Babbitt, DDS, Inc. This patient lost her existing tooth due to fracture and subsequent failed root canal therapy. 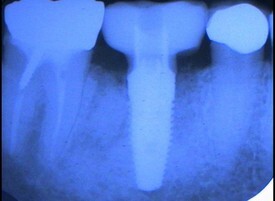 Tooth was extracted and an immediate dental implant was placed at the time of extraction. Three to four months of healing time was allowed for bone to integrate with dental implant. 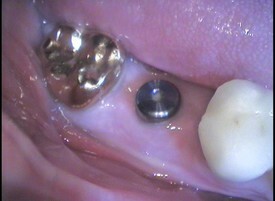 A screw retained implant was recommended so as to not disturb the thick healthy gum tissues. 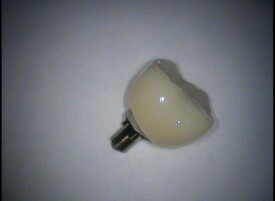 Screw access on biting surface was closed using esthetic, tooth colored composite dental filling material. 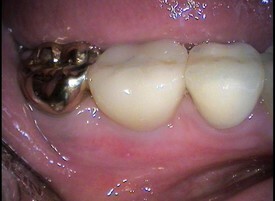 Complete esthetic and functional result was achieved. The patient was very happy with the outcome. I would highly recommend him to anybody and everybody! Our entire family goes to Dr. Babbitt. The staff is friendly and professional. They keep us on track for cleanings and get us in quickly for anything urgent. We highly recommend the office of Dr. babbitt! Ive never been a dentist hater, but genuinely this is the best place to get your teeth cleaned or fixed if needed. Babbitt is a gentleman and Laurie is a sweet heart. i always look forward to Laurie (im sorry if i spelled it wrong!!!) cleaning my teeth. her southern accent and sweet disposition is utterly calming, and anyone afraid of dentists would benefit from being her patient. Bonus, she is fluid in "equipment in the mouth talk" and some how always knows what you are trying to say when talking with all that stuff in there. She's funny too so its actually fun talk with her. Office is clean, bathroom is clean, staff is friendly and utterly helpful. Its a wonderful experience every time. i feel so at ease i could fall asleep in the chair! The reviews are all true! I'm always skeptical of "reviews" as there are a lot of fakes or people who only write about bad experiences. But with no solid leads, just googling for dentists in our network, after seeing so many positive personally written reviews (not just on yelp), my husband and I decided to give Dr. Babbitt a try. I admittedly hadn't been to the dentist in a long time and have always had the typical irrational anxiety over it. Even simple cleanings have made me very uncomfortable. Everything from start to finish was amazing. Stephanie at the front desk is super professional. Dr. Babbitt himself is very professional, nice and honest. His assistant Debbie was really sweet. Aside from my initial consult, so far all I've had is a cleaning but my hygienist Lori was a DREAM. So nice, so personable and real, so gentle and the whole experience was, GASP (can't believe I'm saying this) ENJOYABLE. Even though she's probably seen it all 9 million times, Lori kindly explained everything to me as she went along, and it seriously felt like a salon visit, where you gab with your stylist and it goes by quickly. I don't know what my dentists in the past were doing, but I never thought it could be so simple and easy. I have yet to have any extensive work done but I'm actually not dreading it like I have in the past. So glad we found this place! Stephanie is the sweetest receptionist. She's always kind, couterous and professional. Ready to answer any questions or concerns. Laurie is the best R.D.A. I've been going to her for years and quiet honestly don't trust anyone else with my teeth, lol.. I could listen to her talk all day and she has the best stories! I love and thoroughly enjoy my time with her! Dr. Babbitt and his office are amazing! Everything is always nice and cleanCouldn't imagine going to anyone else.